On Christmas day, Friday December 25, 2009, Rev. Tony Ponticello addressed the congregation at the Community Miracles Center in San Francisco, CA. What follows is a lightly edited transcription of that lecture. In front of the podium are several palm fronds taken from the potted palms that are in the CMC’s meeting room. I laid the palms down here because as you know, especially if you ever heard one of my Palm Sunday sermons, when Jesus rode into Jerusalem the citizens waived palms, which is what they did for the conquering heroes that would return to the city. Waiving palms is actually a military thing. I feel conquering today and that is part of what my talk is about. The name of my talk is “Unconquered” and there are, of course, reasons for that. The reason, as you see on the front page of you program, has to do with Nelson Mandella, who spent twenty-seven years in prison. “Invictus” means unconquered. Its Latin for unconquered. Now I am going to read the poem Invictus. It’s not a long poem. Then I am going to talk about certain parts of it. Some people might think this is not a appropriate poem for the holidays, but I actually think it is. It is about being unconquered. This poem was written by an English poet named William Ernest Henley. It is about him being unconquered, about him being the master of his fate and the captain of his soul. I believe it is a great thing to realize on Christmas morning, that we are all the masters of are fate. We are all the captains of are souls. Regardless what seems to be going on in the world we can take that perspective. Whatever prisons we may think that we are in, as today’s lesson says, those prison doors become open. This does not mean, necessarily, that appearances change, but our soul is open, and our mind is open. We feel differently, and we feel free. It’s about feeling freedom now. As I said this was written by a poet named William Ernest Henley and there are interesting circumstances about the writing of this poem. It was written in 1875. It was not published until 1888. When it was first published it was untitled. It did not have the title Invictus. That title was added to it later, when in 1900 it appeared in the Oxford Book of English Verse. It is not known if Henley gave it that title or if someone else gave it that title. The interesting facts about William Ernest Henley are that he had tuberculosis of the bone at the age of twelve. When he was a teenager he had to have a leg amputated from the knee down. Several years later he was advised to have his other leg amputated from the knee down as well. However, he fought that diagnosis and found a different physician. He found Dr. Joseph Lister. Henley became a patient of Lister. If you don’t remember, Lister was the famous surgeon who came up with the concept of antiseptic surgery. He realized that it was a good idea to clean the instruments before you use them to cut into people. Doctors didn’t know that germs were spread that way. Henley became a patient of Joseph Lister. Henley spent three years in the hospital at that time. However, he did not have his leg amputated, though he always had trouble with that leg. He was never totally cured, but he did keep his leg. He was in and out of the hospital many years of his early life. It was during one of these hospital stays, when he was twenty six years old, that he wrote this poem Invictus. This poem truly spoke something about him, about all the trials and tribulations that he was going through. Yet, through them he could still declare that he was the master of his fate. He could still declare he was the captain of his soul. I think this is a tremendous thing to realize. Many people know of this poem because they have heard that often quoted last phrase. However not many people know that it was written by someone who did go through some tremendous personal challenges. There is a new movie out called Invictus. That’s part of what has inspired me to give this talk. I saw it with a friend on Tuesday night. It’s a wonderful film, a very inspiring film. It is based on true facts, about the first few years of Nelson Mandella’s presidency. An interesting fact about this movie is it was directed by Clint Eastwood, who is seventy-nine years old. At seventy-nine years old he still is directed two movies a year, and they’re always good. They always do well at the box office. He is still going strong at seventy-nine. He is an amazing inspiration for me. As I said, Nelson Mandella was in prison for twenty-seven years and he was inspired by this poem Invictus not to give up his good energy, his overcoming or unconquered spirit. Sometimes people don’t understand why Nelson Mandella was in jail. They think it was for purely political reasons, and while it was for political reasons it is important to know that he actually led a military arm of the African National Congress. Nelson Mandella was involved in bombing government installations, task offices and other government buildings. There were civilian casualties for some of these bombings and so he was labeled as a terrorist. He was brought to trail and imprisoned as a terrorist. We tend to forget this about Nelson Mandella because we focus on the later part of his life. We should understand he was a military person for an early part of his life and was in prison for some really good reasons and for being responsible for the deaths of some innocent people. I read you the poem Invictus. It is about not being conquered by the situations in life. Invictus reminds me of a passage from the Bible. It’s from Psalms and I am sure many of you know it. “Yea, though I walk through the valley of the shadow of death, I will fear no evil: for thou art with me; thy rod and thy staff they comfort me.” (Psalm 23:4) Whenever we go through whatever we’re going through in life, no matter how negative it may seem, no matter how much it is “the valley of the shadow of death” we can still not fear because God is always with us and his staff and rod is still with us. We are the masters of our fate, and we are the captains of our soul regardless of what’s going on. To me this is a very similar idea, and it truly acknowledges that we will be in situations where there are these outside things that appear to be quite hateful, quite vicious. Yet, if we can remember that it’s just a dream that were having, and these are dream figures, we can offer them up to the Holy Spirit. We can learn something from the experience. When we learn that lesson; we can be unconquered. We can be masters of our fate; we can be captains of our soul. We can remain at peace, strong and calm. I just love this idea. When I was contemplating giving a Christmas sermon this year it was a challenge for me. As you know, Reverend Larry is ill. He has been my partner and our minister here for twenty two years and he is very sick. He has pancreatic cancer. This is a very serious diagnosis. Him not being here has left me with a tremendous work load. He has not been able to come to work for over two months. I have always been over worked, now I am really over worked. We also have been in a tight financial situation for a lot of the year. We lost some major funding. There are other challenging things going on, things that seem to be the cause for me to feel like I am not the master of my fate and not the captain of my soul. It just seems that way, but then I can remember that those are just appearances in a dream that I am having. It is just the way I think about it that is the problem. I can find a spirit guided way to be positive about all these challenges. They are presenting me with important lessons that I need to learn. I can let those things be as hateful and vicious as they seem to be, but I recognized I still can be at peace. I can still be the master of fate and the captain of my soul, just like Henley was, regardless of the things that were going on with him in his life, an amputated leg, and just the way Mandella was being in prison for twenty-seven years. Nelson Mandella was in a small cell where you could touch both opposite sides of the cell when you stretched out your arms. Twenty-seven years of cells like these, yet Henley and Mandella could maintain their powerful perspective on life. We can all maintain our powerful perspective on life no matter what shadow of death we seem to be walking through. We can fear no evil because we have got an answer like today’s lesson told us. I’ve always found it interesting that with these four lines, this lesson, number 359 becomes the longest lesson in the Workbook. The longest lesson in the Workbook always falls on Christmas day. How synchronistic is that? This lesson tells us there is always some form of peace we can have. This lesson tells us that misery can always be replaced with joy, and that all our prison doors are open. They were eventually opened for Nelson Mandella. He had a transformation while he was in prison and he came out a very different kind of person. I thought, as a challenge, I needed to get in the Christmas spirit. I talked about this last Sunday. I started putting on the annual Christmas garb. Our Reverend Dusa Althea gave me a new Santa hat so I could wear one that was not dirty. I got all my Christmas pins out. I did all the things I could think of that would work, especially for me. The Christmas spirit really started for me just this past week when I sent out over a hundred and sixty Christmas cards that I made myself. It was extending much love, joy, and good Christmas feeling to so many people and that did it. It came back to me even before the recipients got their cards. Just the fact that I have done this was a wonderful holiday blessing for me, and I have received abundant blessings and abundant joy just from doing these things. I received a sense of the joy, peace, and happiness from the Christmas season. A Course In Miracles says, “The sign of Christmas is a star, a light in darkness. See it not outside yourself but shining in the Heaven within and accept it as the sign the time of Christ has come.” (Tx.Or.Ed.15.102) Our joy does not come from anything outside of us. It comes from the light that is born from within us. If we see that light as the Christ light, the perfect light of our creation, or however we want to define what the “Christ light” means for us, then we can stand up and feel full of joy and feel the spirit of the holiday season. Our unconquerable souls come from within. We are the captains of our souls. We are the masters of our fate. These ideas are very similar to an A Course in Miracles Workbook Lesson that says, “I rule my mind, which I alone must rule. – I have a kingdom I must rule. At times, it does not seem I am its king at all. It seems to triumph over me and tell me what to think and what to do and feel.” (Wk.Bk.Or.Ed.236) Our mind is our kingdom. That’s what we have to be captain of, our minds. We have to be captain of the thoughts that we think. I love that A Course In Miracles acknowledges that we will have difficulties doing this at times. It sometimes does seem that times are triumphing over me. The Course is very gentle. It gives us our space to acknowledge that we have issues and that we have problems from time to time. However, always does ACIM remind us how conquering we can be over all of these situations and how we can always return to peace. “Let no despair darken the joy of Christmas, for the time of Christ is meaningless apart from joy.” (Tx.Or.Ed.15.108) Go back to the joy regardless what seems to be appearing in your life. This is the lesson for the time of Christ. This Christmas time we have to find that joy within. In another place the Course says, “This Christmas, give the Holy Spirit everything that would hurt you.” (Tx.Or.Ed.15.103) Again, the Course is acknowledging that things do appear to hurt us. Give them to the Holy Spirit and we will have a transformation. We will again reclaim our role as captain, as king over this mind kingdom. Christmas is usually associated with the birth of Jesus. I am sure most of you know what I think. You’ve heard me talk many times before. You know that I don’t have that much association with Jesus and Christmas. I don’t know what to say about Jesus. For me, the whole story of Jesus that comes out of the Bible is a myth. It’s a very interesting myth. It’s a myth that we can use, but nobody can really prove any of it. It is still interesting to refer to, because it’s a shared myth. So many of us know it and it gives us so many wonderful ideas and images. Jesus was a person whose soul and mind were unconquerable, and it is not like difficult things didn’t happen to him. Let’s face it, the crucifixion was a pretty damn difficult thing, but he remained unconquered. By his mental attitude he was “invictus.” He had that same energy that is in that poem and that’s in passages of the A Course In Miracles. Regardless of what was going on in the outside he was able to say, “Father, forgive them, for they know not what they do.” (Luke 23:34) He was able to maintain forgiveness while dying a brutal death being hung on the cross. No Christmas sermon of mine would be complete unless I mention that the early Christians knew that Jesus was not born on December 25th. This date was actually the pagan holiday when Roman citizens were celebrating the sun God, Mithras. The Christians had to have something to celebrate on this day, otherwise they would stand out. They didn’t want to stand out, because if they stood out they would be persecuted. Christians were persecuted during these early years. The Christians church leaders decided to celebrate Jesus’ birth on that day because, previously, they were not celebrating Jesus’ birthday at any time. They adopted some of the Mithras’ celebrations so that the Christians would look like they were in celebration of the Son God. It’s interesting that another name for Mithras was “Deus Sol Invictus” which means “God of the Sun Unconquered”. “Deus Sol Invictus”, It’s got that word “invictus” in it. Mithras was the Sun God and he was never conquered. That’s what his longer name means. Think about it. The sun rises in the east and sets in the west every single day. You aren’t going to change it. It’s going to do it, regardless of what’s going on in your life. It’s unconquerable. The sun is unconquerable and the sun god Mithras was unconquerable. This was the time of year when the sun was returning to predominance in the sky, the days were getting longer and people we’re in celebration of that. I think it’s something for us to celebrate as well. Celebrate “invictus.” Celebrate how unconquerable our soul could be too. Our soul is unconquerable and we need to choose that perception of it. Usually at Christmas we tell people to be of good cheer. “Be of good cheer, it’s Christmas.” There is an interesting A Course In Miracles quotation that talks about “good cheer.” It says, “In this world you need not have tribulation because I have overcome the world. That is why you should be of good cheer.” (Tx. Or.Ed.4.22.23) Again the Course is acknowledging that we have problems, tribulations, in this world. It never stops acknowledging this all throughout it. We have tribulations but Jesus overcame the world so we can be of good cheer because we can do as he did. As I said, I relate to the Jesus story as a myth. Nobody really knows. However a myth is a story. A story is full of ideas and ideas are images. Myths are shared images and so they have incredible power. We have this shared Christmas image, this story has incredible power. A Course In Miracles says, “My thoughts are images which I have made.” (Wk.Or.Ed.15) Everything that we think, all these ideas of Jesus that we have, are images that we have made. They can inspire us. Even though I relate to the story of Jesus as a myth, I am still inspired by it, and we can all be inspired by this day that celebrates his birth, even though it isn’t his actual birthday. Even though there are all these other questions around Jesus, Jesus is still a beautiful idea and what we are celebrating is the life of an unconquerable soul who always maintained his power even in the midst of all kinds of things that were happening to him. The poet, William Ernest Henley, was unconquered by the situations in his life. He was the master of his fate; he was the captain of his soul. Nelson Mandella found, in prison for 27 years, that he wasn’t truly a victim after all. He had a violent past. He was spending these 27 years in prison. He was still the master of his fate; he was still the captain of his soul. Think of what that led him to. He won the Nobel peace prize in 1993. 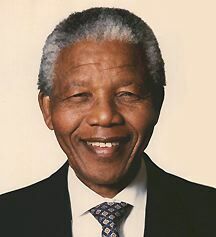 He became president of South Africa in 1994. He was 75 years old when he became president of South Africa. He is still amir. He’s 91 years old and he still makes speeches for the cause of peace, reconciliation, and forgiveness. He is still working for peace in the world. Let us be inspired by all these people. Let us be inspired by the story of Jesus. Let us be inspired by the poet William Ernest Henley who, by the way, after not having that second leg amputated went on to have thirty years of a very productive and normal life. Even though he had all those things he was unconquered. President Nelson Mandella was unconquered. Whatever is going on in our lives, let us also be unconquered. Let us be “invictus.” Let us be a worshiper of the Sun God within, the star within that fills us with light, that gives us good cheer because it tells us how to overcome all of our tribulations. This article appeared in the December 2009 (Vol. 23 No. 10) issue of Miracles Monthly. Miracles Monthly is published by Community Miracles Center in San Francisco, CA. CMC is supported solely by people just like you who: become CMC Supporting Members, Give Donations and Purchase Books and Products through us.